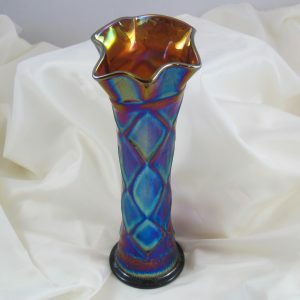 AMAZING GLASS COLOR & OPAL! This is one fabulous pattern! It’s Dugan’s Inverted Fan & Feather and this glows like you wouldn’t believe! When these were made the glass color was called “canary” but nowadays it’s referred to as vaseline at least here in the U.S. The opal is nice and even all the way around and it has great fire! This shape is unusual in that it is reminiscent of a card tray but it is deep like a flared bowl too… unsure it’s proper name. Regardless the pattern and shape are delightful! The feet are fine but uneven in that the piece will rock if it is not placed on something like a doily or such. Made in the very early 1900s.